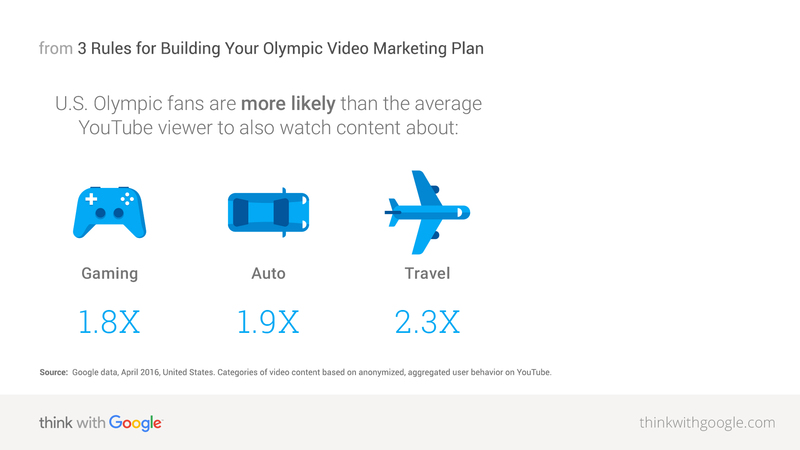 When it comes to video's role in your Olympic marketing plan, no doubt sports content and real-time marketing are key components. Kate Stanford, director of YouTube Advertiser Marketing, spells out how and why brands might want to expand their YouTube strategy to capture the full opportunity. The 2016 Summer Games are just around the corner, bringing together thousands of the world's best athletes for 17 days of competition and camaraderie, with billions of fans tuning in across the globe to watch. While much of this watch time will happen on TV, digital is playing an ever-increasing role. In the last 12 months alone, YouTube watch time for sports like track and field, gymnastics, swimming, and volleyball exceeded total watch time for all of the estimated content ever broadcast on ESPN by 30X.1 And those numbers will undoubtedly rise as the games take center stage. 1. Don't create video content around sports alone. Expand your content strategy to the culture around the games. There are rich territories for brands to explore—beyond sports—when it comes to content creation. Sports-related content is a no-brainer, especially if that's an easy tie-in for your brand. But the Summer Games are much more than a sports competition alone. They're a cultural event in a foreign locale with representation from nearly every country across the globe. Naturally, the games spark interest in music, language, travel, and cooking related to the region where they're hosted, and even beyond. London travel-related search interest on YouTube nearly doubled during the Summer Games in 2012.3 And during the 2014 Winter Games, Sochi travel-related search interest grew more than 20X year over year.4 The fact that we saw search interest increase while the games were live (versus the months preceding the games) suggests that it was driven by fans who watched the games and were inspired to learn more about the host city. Another major event—the Super Bowl—provides a source of inspiration. Visit California realized its opportunity when Super Bowl 50 was hosted in San Francisco. Football wasn't the most obvious brand territory for Visit California to play in, but knowing that the spotlight would be on California, the brand took the opportunity to highlight the wonders of the Golden State with a three-episode YouTube video series, "Bay Area or Bust." The series featured football legend (and former San Francisco 49er) Joe Montana hitchhiking his way to the stadium for game day with YouTube creators like Brandon Armstrong, Brittani Louise Taylor, and Tyler Ward. "The 'Bay Area or Bust' web series was a modern way to celebrate one of the biggest sporting celebrations of the year in a uniquely Californian way," said Caroline Beteta, president and CEO of Visit California. "The series allowed us to connect to a wider audience and showcase California's beauty, road trip experiences, and love of sports." 2. Don't look for audiences on just sports content. Reach broader, but smarter. If your aim is to reach a broad audience with your games-related messaging, you'll be limiting your reach if you only target sports fans. This means that you can't reach your full potential audience by targeting sports content alone. Rather, you have to reach viewers no matter what they're watching, which requires being broader, but also, smarter. This is where custom affinity audiences come into play. With custom affinity audiences, advertisers can both create and target specific segments, like "Brazilian-travel enthusiasts" or "Olympic-viewing moms," and reach them across YouTube and more than 2 million websites. Google data, April 2016, United States. Categories of video content based on anonymized, aggregated user behavior on YouTube. Our own Google Play team saw success with this kind of approach during the Oscars. The team wanted to make it easy for movie fans to find the winning movies in the Google Play store as soon as they were announced. 3. Don't just create real-time marketing. Gather real-time insights. When time's precious, like the 17 days of the Olympics, every moment counts. Real-time marketing enables brands to quickly and scalably create and launch an ad that's highly relevant to a live moment. But speed isn't only important to execution. It's equally important to measurement: What's working, how well, and among which audiences? Take, for example, the Conservative Solutions PAC's work during the Republican presidential candidate debate in October 2015. As Marco Rubio discussed national security in a debate, BASK Digital Media pushed out ads with actual quotes from the candidate in real-time to likely voters in Iowa, New Hampshire, and South Carolina. Not only did the team connect with real-time relevance, it also used its learnings about how the ads performed to optimize on the fly. "Using Google's real-time ads, we were able to achieve immediate massive scale in Iowa and instantaneously echo, with online ads, the messages the candidate was delivering during the debate. Not only that, but we were able to see which messages were resonating with our key audiences by looking at performance reports and optimizing our campaign accordingly," said Amanda Bloom, media director, BASK Digital Media. Speed isn't only important to execution. It's equally important to measurement. One place to start gathering real-time insights is in the demographics report in YouTube Analytics. This can help you understand the age and gender distribution of viewers engaging with your content. Ask yourself, is the demographic you're trying to reach the one that your videos are actually connecting with? Also consider using YouTube Analytics to A/B test ad creative in just one to two days. By running two versions of creative, you can then go to Analytics and see how they compare for metrics like skip rate and watch time. And when it comes to brand metrics, like moving the needle on purchase intent and brand searches, try using Brand Lift, which in as little as three to five days provides even deeper insight into how your campaigns are performing for metrics like consideration, interest, and purchase intent. Advertisers like Mondelez and Mountain Dew are using these test-and-learn approaches with creative to drive greater results. As we approach the Olympic opening ceremony, it won't just be the athletes on the field vying for gold. Over the 17 days of the Olympic Games, marketers will compete to capture consumer attention. As major sporting and cultural events become richer because of digital, these moments are becoming more personal. Marketers can make the most of these moments by embracing the culture around the games, finding fans even when they're not tuning into sports-related content, and building a feedback loop so you can learn and optimize your campaigns in real-time. 1 Google data, U.S., Classification as a "track and field," "gymnastics," "swimming," or "volleyball" video was based on public data such as headlines and tags, and may not account for every such video available on YouTube, Mar. 2015–Feb. 2016. Content broadcast by ESPN was estimated by adding the number of days since its first broadcast. 2 Google Trends, YouTube Search, Worldwide, Jan. 2011–Mar. 2016. 3 Google Trends, Travel Category, YouTube Search, Worldwide, Aug. 2012 v. Aug. 2011. 4 Google Trends, Travel Category, YouTube Search, Worldwide, Feb. 2014 v. Feb. 2013. 5 Google Consumer Survey, U.S., Apr. 2016. 6 Google data, U.S., Apr. 2016. Categories of video content based on anonymized, aggregated user behavior on YouTube.